From Edinburgh we travel via Rannoch Moor to stunning Glen Coe, where we make our first stop, before continuing on to Fort William. We drive through the Great Glen to mysterious Loch Ness, where you can visit Urquhart Castle and take a ‘monster-spotting’ cruise *. The road bridge to Skye takes us from mainland to island. After a stop for lunch, we follow the scenic route with wonderful views of the striking Cuillin Hills all the way to Portree, the island's main community. Why not take time out to visit the picturesque harbour with it's colourfully painted houses? Our return journey south encompasses the Spey Valley, the picturesque Cairngorm National Park and the dramatic scenery of the Drumochter Pass. 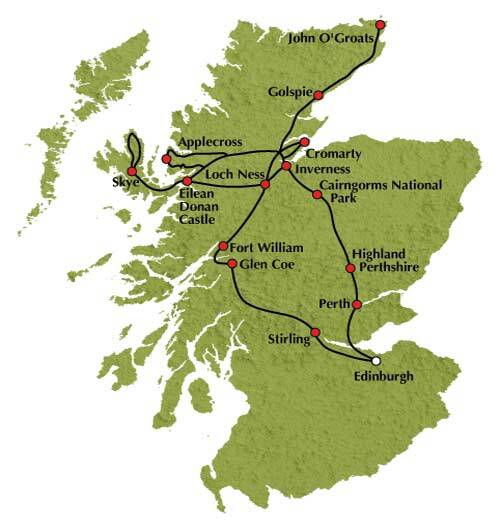 The last part of our journey together will take us through the heart of scenic Perthshire and the Kingdom of Fife. Our tour ends on our arrival in Edinburgh.